1. Preheat the oven to 180°C, gas mark 4. Use a food processor to blitz the nuts until they are almost finely ground – leaving a few larger pieces for texture. Alternatively use a sharp knife to finely chop them. Stir in the cinnamon and set aside. 2. Cut the filo sheets in half to make equal sized squares, stack all 8 squares of filo on top of each other and cut into 12, so the squares are slightly bigger than the holes of a 12-hole muffin tin. Melt the butter in a small saucepan, then use a pastry brush to coat each hole in the muffin tin with the butter. 3. Press a square of filo pastry into each hole then brush with butter. Repeat twice more, so each hole has three sheets of butter-coated filo pastry in it. Spoon a teaspoonful of the ground nut mixture into each filo-lined hole, then repeat the butter and pastry process three more times. 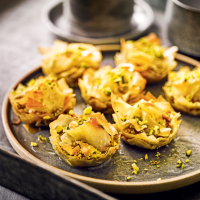 Divide the remaining nut mixture between the tarts, then top each one with the remaining scrunched pieces of filo to create a textured appearance. 4. Brush the top of each tart with butter, then bake for 15 minutes or until golden brown and crisp. 5. While the tarts are baking, make the syrup by placing the sugar into a saucepan with 100ml water. Stir in the orange blossom and rose water and warm over a low heat, stirring occasionally, until the sugar has dissolved. When the mixture is clear, turn up the heat and simmer for 4-5 minutes or until thickened and reduced by one-third. 6. Pour the hot syrup over the tarts, making sure to drizzle it down the edges so it soaks through. Roughly chop some extra pistachio nuts and sprinkle over the top of each tart. These are best eaten warm.